This post is highly requested! It's good to know that I'm not the only mom that spends a lot of time in deep thought day and night thinking of what to feed my child! Tito, is a picky eater, don't let this video deceive you oh. He is like me, he will scrutinise what he is about to eat and if it is something that me, his mother cannot eat because it tastes like "baby food" Tito may not eat it. I keep saying his taste buds are mature. In this video I will show you what he has for breakfast, snack time, such and dinner, also what he drinks. Don't forget to SUBSCRIBE to my channel so that you always get updates from me! Background: Tito is 22 months old. If you want more videos like this, please let me know by leaving a comment or sending me an email! 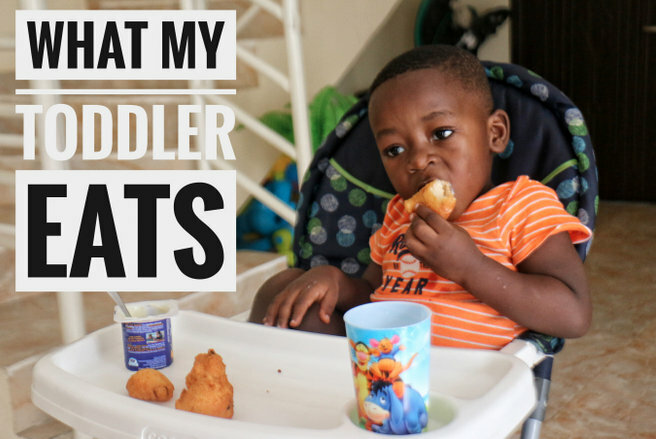 What do you feed your baby/toddler? I enjoyed the video, Tito is such a happy eater. Feeding little ones is very tricky but you seem to have mastered it. I have a 5 months old and i have started to introduce solids and he is playing along and this gives me so much joy. Feels like i am winning, so today i tried blended oats with mashed banana for the first time and this boy cleared the plate!!!!!! I never hesperred it! Sisi, how can I ever miss any of ur videos? This one is particularly awesome! Tito for president! Sisi dear, it can be quite exhausting figuring what picky toddlers would eat. Watching dis video gave me some ideas. Thanks for sharing! No wonder he looks so healthy. Wow! Tito dey enjoy ooooooooooo. Kudos to Mama Tito. see better pikin ooooo. chaiiiii. Father help me!